Do You See The People Spin? 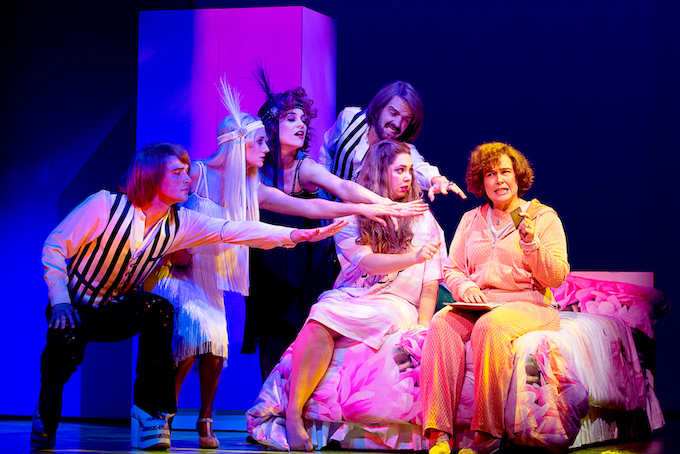 Not any more, in this epic new production of the world’s favourite musical. No revolve and a few projections- that was as much as I knew of this new staging going in, so imagine my surprise when these aspects turned out to just be the tip of the iceberg in terms of changes. There are tweaks to the music and lyrics, but the biggest change is the use of full-sized sets. This production is as close to operatic in scale as I have seen in music theatre. Countless costumes complete the blockbuster scale, with projections, both static and animated, adding to the grand effect. Instead of pretense, there are now massive sets for scenes such as Fantine’s factory, the Thenardiers’ Inn, the student headquarters and the streets of Paris, which feature backlit shutters in a nice nod to the original design. 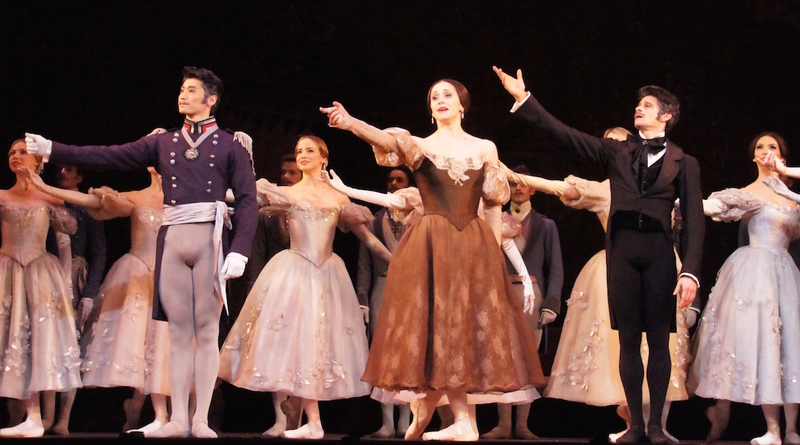 The scope of production certainly eases fans of the movie into the theatre, with projections also helping in scenes like the shipboard opening (which replaces chain gang convicts hammering rocks), the sewer and Javert’s death. Perhaps the most brilliant use of the animated projections is in “One Day More,” where the students still do their famous march on the spot, but at long last appear to actually get somewhere, as the projections take them along the streets of Paris. There a couple of odd choices with the sets, for example the student headquarters does not come back on for “Empty Chairs at Empty Tables” (so there are actually no chairs and tables on stage), and only a park bench is used rather than Valjean’s gate/house for the late reprise of “A Heart Full of Love.” The revolve is generally not missed at all, except for that heartrending revolution in the original at the end of the battle when the stage and barricade were strewn with bodies. Any of the minor changes to lyrics, and associated music, are there to streamline and assist the storytelling. 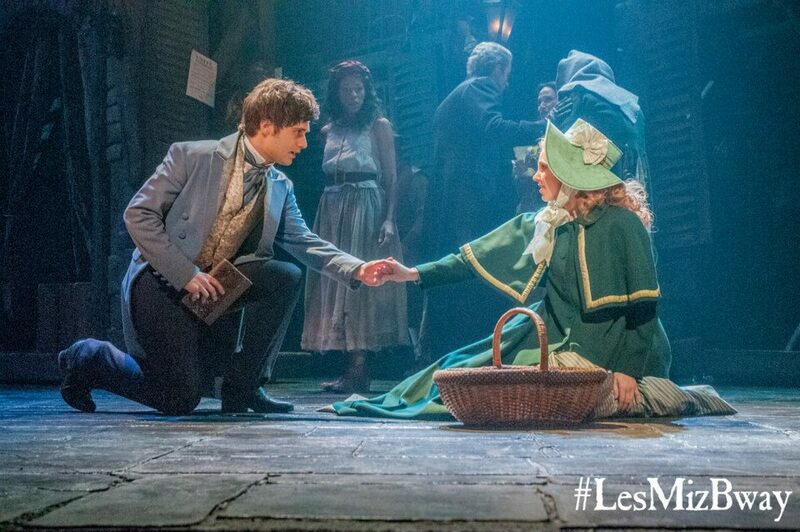 Noticeable moments include a different verse in “Lovely Ladies,” and the inclusion of a brief scene when Valjean finds young Cosette in the woods. The song “Suddenly,” written for the 2012 movie, has not been inserted. In terms of the music itself, there is significant improvement and updating in the scoring, with a 17-piece orchestra providing a much richer sound than the original 1980s synthesized sound. There are any number of clever touches in the new direction. 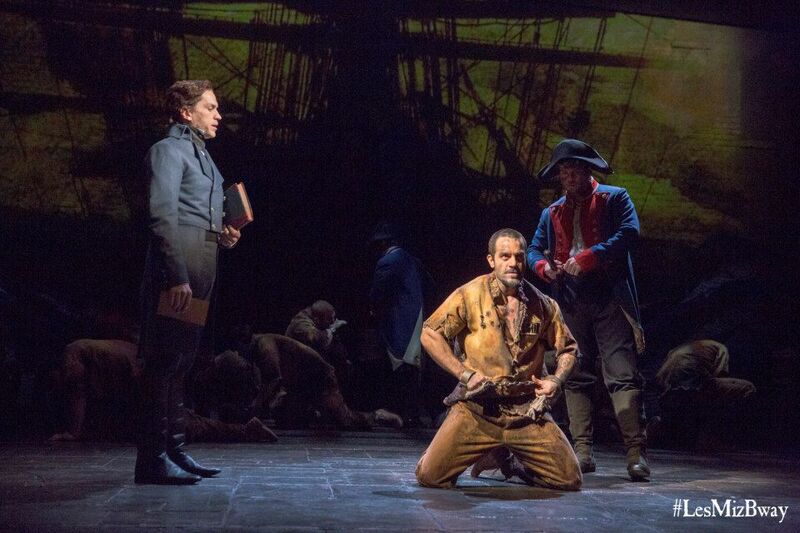 In a nice piece of foreshadowing of the barricade showdown, Valjean has an earlier chance to kill Javert in “The Confrontation” and again lets his adversary go. Having fleeced Valjean for young Cosette, the Thénardiers get frisky with each other as the scene dissolves. 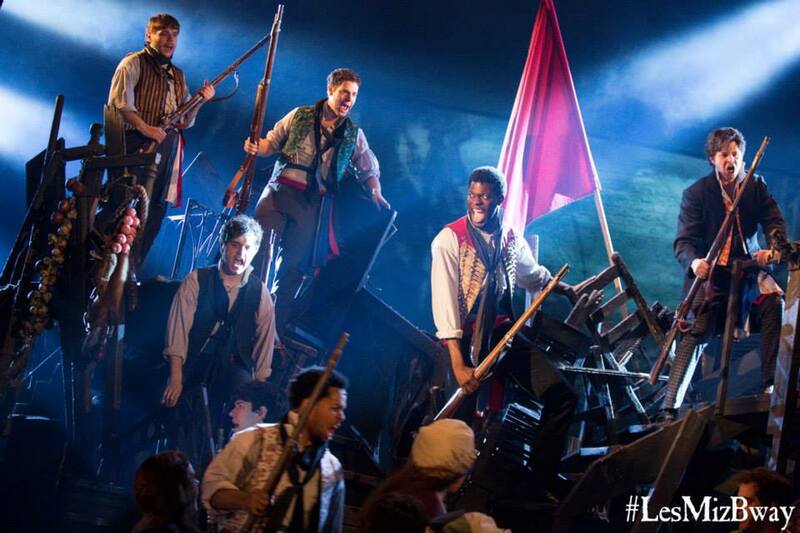 Enjolras makes a dramatic point in the student café by lifting the red flag to reveal rifles, dramatically raising for the young revolutionaries. Also, audience intelligence is rated highly enough to avoid the need for projections stating the city and year as the story progresses. Christine Rowland (Mary Poppins) joins original designer Andreane Neofitou in adapting Neofitou’s original costumes. Young Cosette dons a pale blue coat, to match her mother Fantine’s dress. This then identifies grown Cosette (rather than the original black dress with white square yolk) plus her hair grows to match Fantine’s blonde waves. 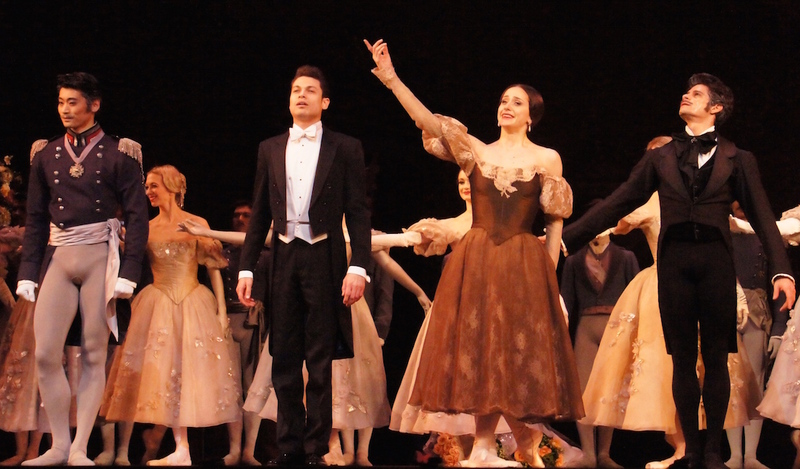 The women wear a rainbow of pastel dresses at Marius and Cosette’s wedding, at which the Thénardiers look more garish than ever. The sound of bullets ricocheting around the auditorium practically had the audience ducking for cover thanks to the excellent sound design. Ramin Karimloo fully deserves the excellent reputation that precedes him. 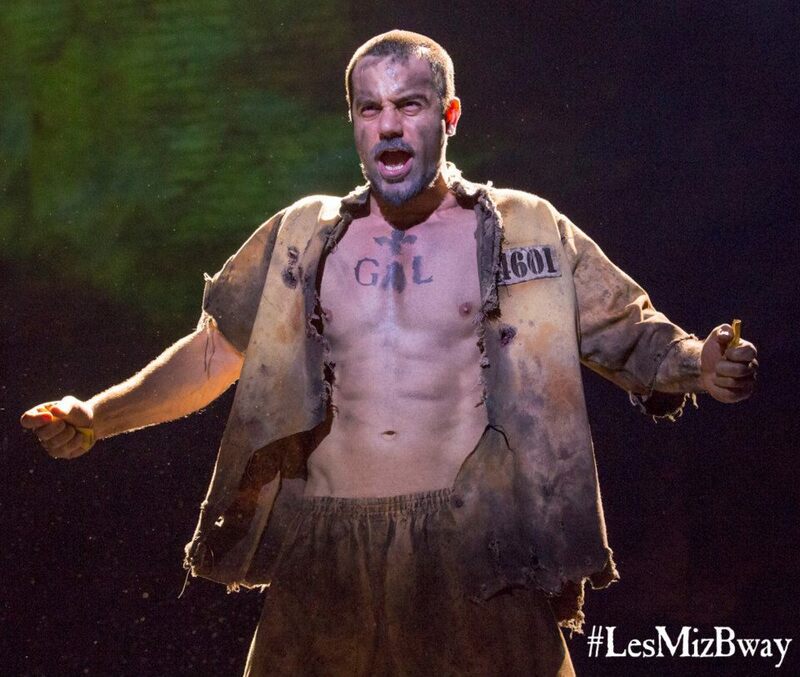 Surely the first Valjean to display his abs on stage, Karimloo also sings superbly, balancing a sweet falsetto with a powerful belt. The cast of experienced Broadway performers are reliably excellent. Will Swenson (Hair, Priscilla) does far more than stand and bark as Javert. Caissie Levy (Hair, Ghost) is a fragile but plucky Fantine. Nikki M. James (The Book of Mormon) is a stoic Eponine, her voice soaring through the well-known songs. Cliff Saunders and Keala Settle are energetically vicious and delectably finny as the Thénardiers. 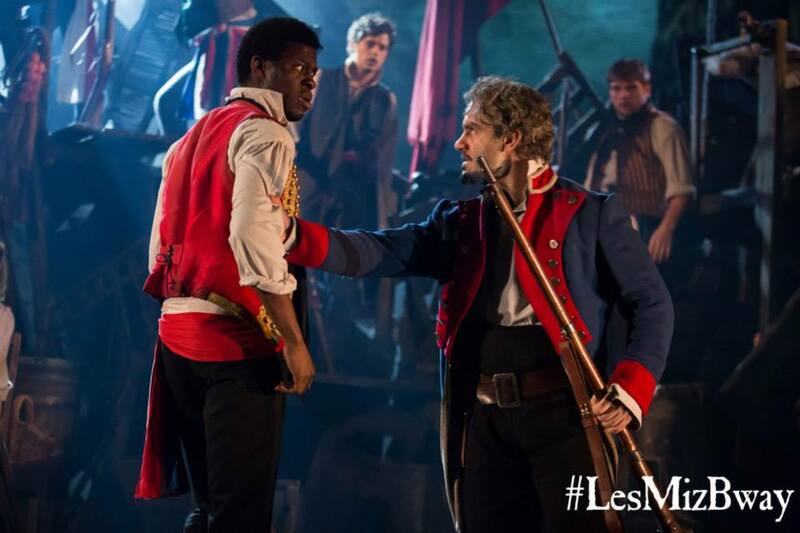 Kyle Scatliffe makes an exceptionally strong Broadway debut as Enjolras. Andy Mientus, so funny in 2012’s Carrie (Off-Broadway), makes an auspicious and well-deserved Broadway debut as Marius**. The extent of the changes in this sensational new production will cause even the most die-hard fan to see the show in a new light, with the whole affair to be all the more thrilling when seen with the brilliant new Australian cast. 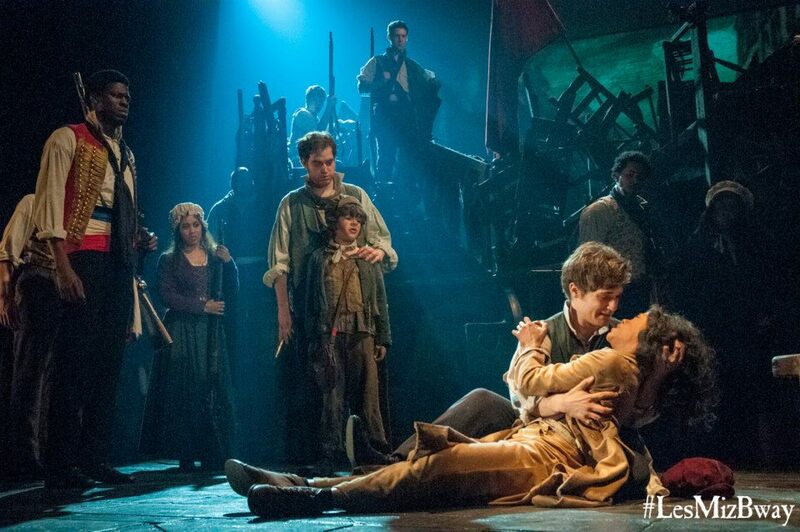 Les Misérables was reviewed 2pm 16 April 2014 at Imperial Theatre, New York, where it is playing an open-ended run. Footnote: in another example of corporate greed (see Aladdin), the t-shirts at Les Mis are a whopping $40, making them 33% more expensive than the rest of Broadway. One can only hope that lack of sales will cause a re-think on this attempted gouging of consumers. Here is hoping Oz tour is not scaled down too dramatically. I am hoping the exact same thing Craig! I don’t think the proscenium arch at the Maj as high as at the Imperial to begin with. They have decorated the roof and walls around the pros right into the auditorium – looks like it is all set for a long stay there. Fingers crossed our production will be as close as possible to this one – it really was incredible to see. Sounds slightly better than the underwhelming experience in LA a few years ago. At least this cast will be better than the one I saw. I didn’t like the changes. I sent a message to Hayden Tee a few days ago on Twitter & he’s getting excited about being back on stage in the Melb production. I thought I wouldn’t like changes but they all enhanced the storytelling so well. I just hope that the Australian staging is as close as possible up the epic scale of this one. Can’t wait to hear Hayden Tee and all the Australian cast in action! It’s going to be quite exciting! See you back in Melbourne soon!